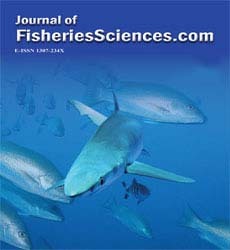 In this study, the rings on the scale and otolith of known age seabass, Dicentrarchus labrax were evaluated. Fork length and weight of specimens ranged 6.6-21.4 cm and 2.83-147.72 g, respectively. The minimum-maximum values of otolith were 0.0033-0.0370 g in weight, 2.920-8.249 mm in length and 1.679-3.942 mm in width, respectively. The relationships of otolith weight, width, and length between fork length were determined as y=0.002x–0.0106 (R2=0.98); y=0.1515x+0.8143 (R2=0.96) and y=0.3405x+0.9841 (R2=0.98) respectively. Although the scales and otoliths of specimens had opaque rings before the fish were transferred the sea cage, they had the check rings which are not true age rings on the sea cage period. The ring is referred as stock ring which has 0,73 mm ve 1.119 mm radius were determined on the scales and otoliths of 0 year known age on seacage specimens, respectively. It must be take care on age determination due to stock ring overestimates one year to fish age.